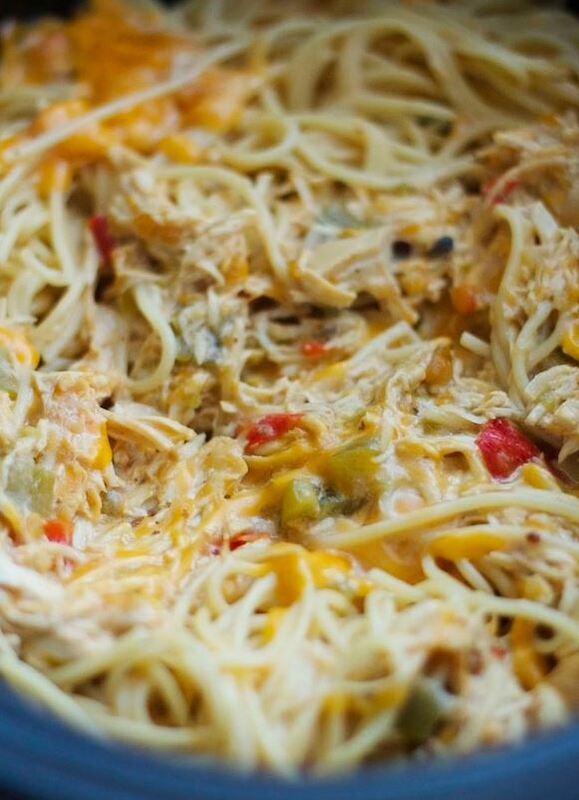 Place onion, bell peppers, green chiles, cumin, garlic powder, salt, pepper, chicken, mushroom soup and 1 cup of grated cheese together in a crock-pot. Stir to mix ingredients. Cook on high for 3-4 hours or until chicken is fully cooked. Remove chicken breasts, shred and return to crock-pot. Pour in cooked spaghetti and remaining cheese. Toss to coat pasta in sauce and melt cheese, adding in a few splashes of chicken stock where necessary to get sauce consistency you want. Cook another 20-30 minutes on low and serve. Is it okay to omit the can of mushroom soup?